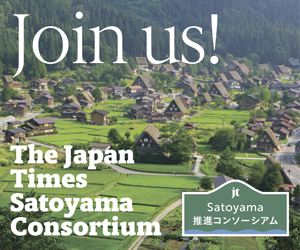 A two-day event on topics related to satoyama (mountains and woods shared and maintained by residents of the adjacent rural communities) was co-hosted by the Japan Times Satoyama Consortium, the Chugoku Region Governors Association and the town of Jinsekikogen in Hiroshima Prefecture at the Jinseki Kogen Hotel on Oct. 20 and 21. 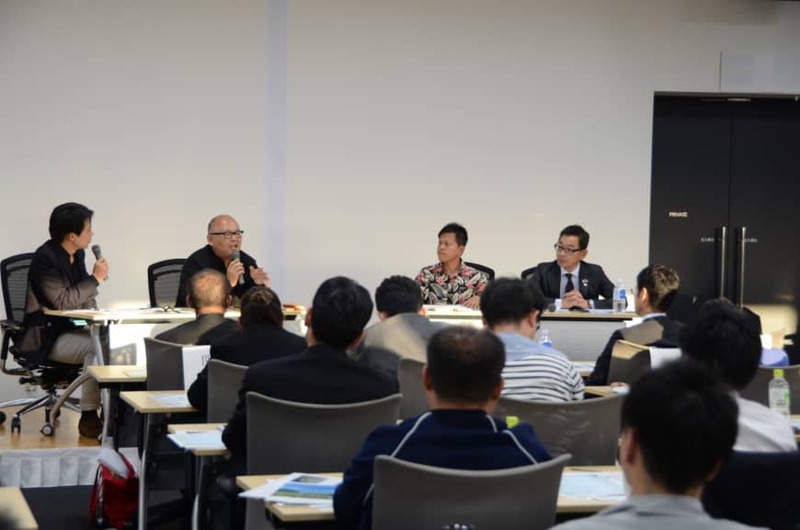 In the second panel discussion of the first day, Retsu Fujisawa, the representative director of RCF, an association that specializes in coordinating social projects in collaboration with diverse stakeholders, led the discussion as a facilitator. Three panelists shared their insights on regional promotion and the role of education with about 200 attendees. Masahiro Ohnishi, a regional revitalization consultant who heads an organization called Socio-Design, puts entrepreneurial education as the core of the regional revitalization in the town of Kamikatsu in Tokushima Prefecture. Ohnishi thinks that a local high school is an important asset in a rural community. “If children have to leave their hometowns and live elsewhere to attend high school, it becomes difficult for them to come back after graduation, making it harder to put an end to the depopulation trend in rural areas,” he said. According to Ohnishi, it has been a conventional fear shared among the people in rural villages that educated young people who have grown up in remote areas tend to move to cities. “People have to let go of that fear and make the community itself into a school where not only teachers, but everyone in the community is responsible for educating children,” he said. 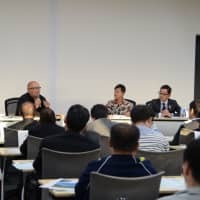 Ohnishi emphasized that it is important for children to learn to create answers rather than always being given choices to acquire skills to start their own businesses wherever they are. “Spending at least 12 years of school in your hometown helps nurture pride and attachment to the place,” he said. Career Education Designer and CEO of Jibunnote Inc. Keiji Ohno is based in Suo Oshima, an island in Yamaguchi Prefecture. Ohno provides original career education programs designed to foster entrepreneurship based on regional resources. “Families differ greatly, but everyone can learn equally at school,” he said. At one of the junior high schools where he offers his entrepreneurial program, second-year students work in groups to set up four imaginary companies to create and sell products or services using local resources. Each company makes presentations and they sell their company shares for ¥500 per share to their parents and neighbors. “We have been doing this every year for seven years. The longer we continue, the more people we can involve, gradually changing the whole community,” Ohno said. It has been almost 15 years since Ohno returned to his home island from Tokyo where he had worked. He found that only three out of 13 former classmates from his junior high school were still living on the island. “I hope that starting a business will be one of the options for those children who are now experiencing the fun of taking on new things in the community,” he said. The town supports various educational projects including the Namazu (catfish) Project conducted by a group of students at Yuki High School. The catfish grown in ponds the students created with the help of area residents on abandoned farmland are cooked and served at local festivals and at professional baseball games in Hiroshima. The town also collaborates with the Keio Research Institute at SFC in a project called the “Jinsekikogen Drone Academy Organized by Yuki High School Students” launched last autumn. “When people gather to work on the drone project, for example, they won’t talk only about drones the whole time, they’ll talk about all sorts of other things. It is from such conversations that people’s connections form and new ideas sprout,” Irie said. Fujisawa concluded the session by saying that it is important to provide the kind of education that helps people notice and think about how they can use the existing resources in the community to try new things in their own ways.